The article is dedicated to interview of the lawyer Francesco Grasso to the Russian state radio station «Voice of Russia» of 17th of January, 2012. The shipwreck of cruise liner «Costa Concordia» took place on the 13th of January, 2012, near the island of Giglio due to a collision with a rock and have already took away 11 human lives. At the present moment the rescuers are conducting a search of twenty two people. In the mind of people situated on board of Costa Concordia the occurred was associated with a wreckage of Titanic, a tragedy that had taken away thousand of people and certainly caused an immense psychological shock of tourists, who understood that their own lives and lives of their children were in danger. The prosecutor’s authority of Italy ordered to arrest immediately the captain of ship and now it is conducting a further investigation. Actions of a command officer are judged as a criminal offense, but he also responds the civil responsibility in respect of every suffered tourist for received injuries, intended or through carelessness, which can bring to ineffaceable sequences – the constant psychological injury. In the similar cases the suffered should be observed by a doctor within some period of time, they also may need a help of psychologist maybe even a psychiatrist. First of all the children who are more sensitive than adults to such tragic events may need a medical care. What should the suffered in shipwreck Costa Concordia do from the point of view of jurisdiction? The tourists should submit to the competent prosecutor’s authority of the Italian republic their bills of complaint on received injuries (intended or through carelessness), the strongest shocks or psychological injuries, confirmed by medical references or other possible documents, necessary to determine the degree of caused harm. We’d like to remind that the bill of complaint should be submitted within 3 months after the tragic incident videlicit up to the 14th of April, 2012. That concerns the foreign tourists – Russians, Ukrainians, Belorussians, Moldavians, Kazakhs, Chinese, Koreans and others – they can address to the authorized person, as a rule, to a practicing Italian lawyer, after drawing up a notarised letter of attorney, apostilled and translated into Italian language, having authorized the lawyer to submit a bill of complaint to the Prosecutor’s authority of the Italian republic in the criminal process on reimbursement of property or moral damage, caused by traumatic shock. 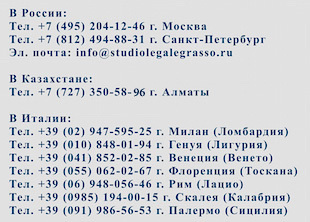 According to the new tourists’ code of Italy within 10 working days after returning to own country (Russia, Ukraine, Belarus, Moldova, Kazakhstan, China, Korea and others) the tourists suffered from a shipwreck should personally sign a complaint form and send them by registered letter with notification of receipt to the main office of company shipowner, address of which is given on the site of Costra Crociere. They should request in bills of complaints reimbursement of all property or non-property damages, such as: return of ticket cost, loss of goods and personal articles, loss of documents, faulty holiday. We advise also to send this bill of complaint by fax or e-mail. As soon as the criminal liability of a ship’s captain and other responsible persons will be established, it will be possible to submit the civil claims against the company Costa Crociere and get compensation for received psycho-traumatological injuries and sustained loss by each particular tourist.